Half of all European display advertising is now traded programmatically, according to findings of a study conducted by IHS Markit for IAB Europe, released this morning at the dmexco conference in Cologne, Germany. 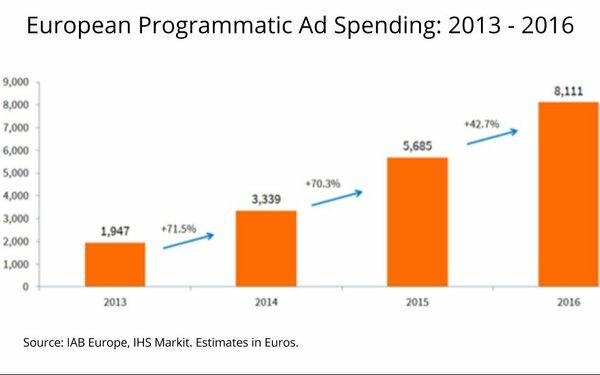 The study estimates that Europe’s programmatic display ad marketplace has expanded 42.7% to $9.7 billion in 2016. The report finds that video is the fastest-growing segment of Europe’s programmatic media-buying marketplace, expanding 155% to a 45% share of all video advertising in 2016. Programmatic mobile ad trading also rose sharply, expanding 65% in 2016. The report reveals that 50.1% of European display ad spend is now traded programmatically. In addition, programmatic video grew by an exponential 155% and now accounts for more than 45% of total online video ad spend. Mobile remains the "most" programmatic format, with 65% of mobile ad spend traded programmatically in 2016.